Vandalism is the willful damaging of property by means of graffiti, inscription, cutting, breaking, or any other means of destruction. It includes damage to vehicles, signs, cemeteries, or any property. Vandalism encompasses many different types of conduct and is a very common criminal charge. 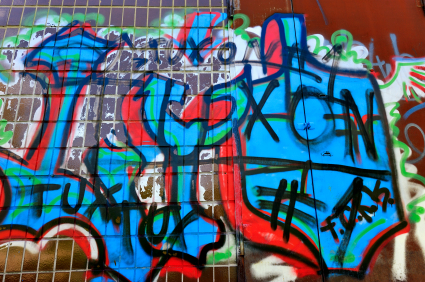 Graffiti - any writing, drawing or symbol applied to any surface without the owners consent. Tagging - writing the person's name or gang affiliation on someone else's property. Acquisitive vandalism - damage to obtain money or property, like breaking a vending machine to get the money or the candy. Vandalism can be filed both as a misdemeanor or felony. The District Attorney will file a felony if the incident resulted in substantial damage to property or if the defendant has a prior record. During the pre-filing stage, District Attorneys make decisions on whether to file a felony, a misdemeanor or no charges at all. We believe that this is an ideal time to approach the District Attorney and to discuss a reduction to a misdemeanor or a non-filing of the case. Hiring The Sheena Law Firm at an early stage in your case will allow us to work on your case and possibly prevent it from being filed at all. Because the potential consequences of a vandalism conviction are so great, you need an experienced defense attorney to protect your rights. We are ready to fight for you. We will carefully investigate the circumstances of the alleged vandalism, including the scene of the incident and the statements of any witnesses. We will then work to prepare a strong defense to attack the prosecution's case against you. The consequences of a conviction for vandalism vary widely, depending on the amount of monetary damage done to the property. It is important to know that a conviction for vandalism can cause your license to be suspended even if the vandalism had nothing to do with driving. However, a skillful attorney can change the nature of the charge, if appropriate, to avoid a license suspension. If you are accused of vandalism, you should speak to a lawyer immediately to learn more about your rights, your defenses and the complicated legal system. Call The Sheena Law Firm today to discuss your case.